closures, clones, selections – must not just be left to chance. 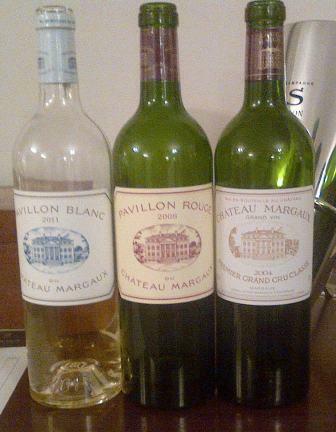 Pavillon Blanc du Chateau Margaux 2011 – I was very interested to taste this especially as I have recently had the 2007. The 2011 is a lovely wine, taut on the opening, white fruit and good texture, a little lanolin too. Coming back to it after the reds it had opened up a lot to reveal a little lychee, coconut and melon but without being in any way sweet, very complex. I think that along with great white Burgundy and German Riesling this is a great style of wine to have in the cellar. The wine itself is, unusually, 100% Sauvignon Blanc and does not go through malolactic at all, it sees 8 months on oak only 25% of which is new, this has dropped in recent years from 33-35%, a good thing in my book. 1000 cases are made now, before 2005 it used to be 3000. The team there are also looking at bottling more in magnum in the future, I’ve never seen it in magnum!! The plot that the wine itself is made from is 11 hectares in size and 4km from the main property it used to be planted with red varietals but was prone to frost. From a marketing perspective it is a little strange to have the second red wine and the first white wine sharing the “Pavillon” name so it may well be that the white becomes Chateau Margaux Blanc soon, we will have to wait and see. It was while tasting this that Aurelien mentioned the procedure that the Chateau goes through in selecting it’s corks. They buy bags of 500 made from only the cork in the middle of the tree, they then randomly take out 50 and place them in glasses of water, when the water is tasted later that day if any has an aroma that is anything but perfectly neutral then the whole bag is binned! Oh, and on the Blanc the bottle itself has a neck just a fraction narrower so as to keep the pressure higher and reduce the chance of any oxidation. Ch. Margaux 2004, having said “man” I think it is best to say that Margaux is the most feminine of the first growths by consensus. The 2004 is a really lovely wine. Bordeaux as it used to be in many ways. Very classical, lots of lovely elegant red and black fruits with no one fruit shouting at you. The tannic structure is there but coats the tongue rather than attacking it. It is approaching drinking now but at the same time will age and develop gracefully over the coming decades. In both pricing and style the 2004’s are arguably the last classic drinkers vintage. This wine just shout “drink me” at you. The alcohol is always very low, by modern standards and this adds to the easy elegance of the wine.